We are lucky this year in Y6. As well as having Miss Padgett with her fantastic art skills as our teaching assistant, we also have two teachers! Mrs Harper and Mr Milfull. Our topic of Parliament and Democracy has so far meant that we were extremely clued up when some of our Year 6 children put themselves up for election for house captain. We were sure everything was carried out democratically (which comes from the Greek; Demos meaning People and Kratos meaning rule). We are sure our new captains will represent us well in our new house teams of Falcon, Owl, Eagle &Kestrel. As well as a visit to Ripon Law and Order museum we have our highly anticipated visit to the brilliant Robinwood we can’t wait for the zipwire, climbing wall and famous piranha pool! This is all before half term! Who knows what the rest of the year has in store (but we are sure it will involve a certain government test at some point!). 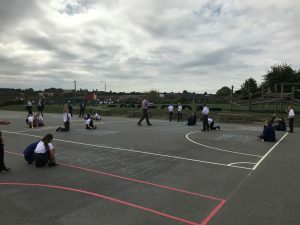 Our Y6MH Practical Maths – Numbers up to one million.